These steamed wraps are based on Mediterranean dolmades (stuffed grape leaves), but in this recipe I do them with an Asian twist and use a Thai-inspired flavor combination for the filling. 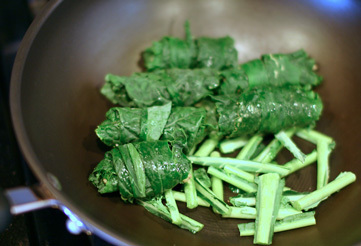 The slight bitterness of the steamed kale leaves is a nice complement to the sweet and spicy filling. I entered this recipe in a contest on my favorite vegan blog, YumUniverse. Blog author Heather Crosby offers a veritable treasure trove of amazing plant-based recipes and very useful advice. Whenever I’m looking for a new recipe, I know I can make any of hers and it will be delicious, and several are already part of my usual meal rotation. My admiration for Heather and her blog made it extra special for me that my recipe was awarded second place in her Kale Recipe Contest. I’m still buzzing with excitement about that! 🙂 It was the extra bit of validation I needed to get my own blog up on line, so this recipe is a particularly appropriate choice for my first post on Green Sage. The recipe I share below is a little different from the version I submitted for the contest. I’m always reworking recipes in an effort to improve them, and for this one I’ve made some flavor-boosting changes to the ingredient quantities. I got a seal of approval on the changes from my tasting panel (my husband), so I’m excited to share this new version with you. Rinse the buckwheat groats thoroughly. Salt and boil the water in a saucepan, then add the buckwheat, cover and reduce to a simmer for 8 minutes. Taste to make sure it’s cooked. Pour the buckwheat and cooking water through a strainer, and then rinse the cooked buckwheat with cold water to stop it from overcooking and rinse away the starch. This should give you fluffy buckwheat for your salad. While the buckwheat is cooking, heat the coconut oil in a small pan and lightly sauté the green onions, garlic and ginger. Add the zucchini toward the end, just long enough to take off the raw edge. Remove from heat and set aside. Put your two chopped curly kale leaves in a medium bowl. 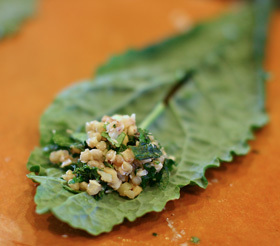 When the buckwheat is cooked, transfer it on top of the kale and allow the heat to wilt the leaves a bit. Add the lemon juice, nama shoyu and rice vinegar, and mix thoroughly. Add the black pepper and cayenne and mix again. If you like your food to have a spicy kick, be generous with the pepper, especially the cayenne. Finally, add the sautéed mixture, coconut, peanuts/cashews and cilantro and mix once more, then taste and adjust the seasoning to your liking. Set aside. Shortcut alert! If you don’t have time to take the final steaming step, the filling mixture makes a delicious meal all by itself. If you’re continuing, run a sharp knife down each side of the stem of the Lacinato kale leaves to remove the thickest part of the stem (leave the thinner part near the top of the leaf intact), but keep the thick stems and chop them, then throw them into the bottom of a wok. Lay a de-stemmed kale leaf on a flat surface. Place a scant tablespoon of the filling near one end of the leaf (if you’re a salt fiend, you can sprinkle the inside of the roll with a little fine sea salt) and then begin rolling. Tuck the end you are holding underneath the filling, and then continue much like you’re rolling a burrito. Line up the rolls snugly in the wok on top of the pile of kale stems. The stems hold the rolls away from the bottom of the wok, out of the water you’ll use to steam them. I learned this steaming technique from Mark Bittman, in his book How to Cook Everything Vegetarian. Pour a cup of water into the wok and turn the heat up to medium-high until the water boils. Once it boils, take the lid of any large pot and rest it over the kale leaves (or use the lid that came with your wok if you have one – I don’t). Reduce the heat to medium low and steam the rolls for eight minutes. Allow them to cool a little bit before you remove them from the wok. Enjoy! Ginger is known to reduce inflammation in the body, aids in digestion and improves circulation. Coconut contains lauric acid, a medium chain fatty acid that is metabolized and converted to energy easily by the human body. 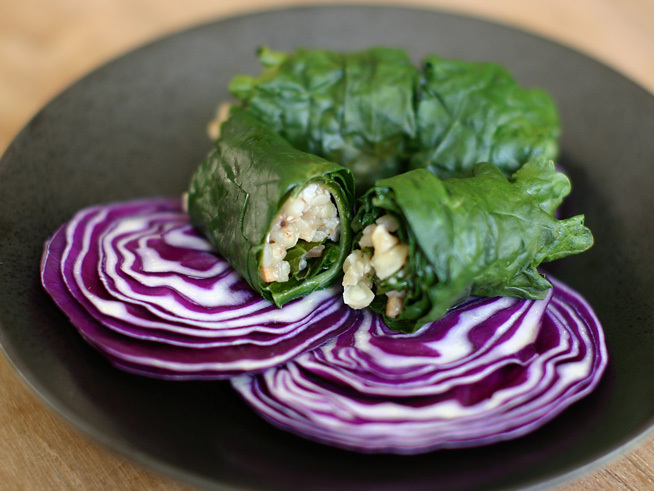 8 Responses to "Steamed Buckwheat-Stuffed Kale Leaves"
Thank you so much, Heather! You are an inspiration to me. Hi Marissa! Coconut aminos are the raw sap of coconut trees, mixed with a little sea salt (those are the only two ingredients), and according to the back of my “Coconut Secret” brand bottle, the sap is “raw, very low glycemic, an abundant source of 17 amino acids, minerals and vitamins and has a nearly neutral pH.” It also says that it’s fermented and enzymatically alive. It’s a great option for people who are sensitive to or trying to avoid soy, and it might be a safer alternative if you’re concerned about MSG and and the whole hydrochloric acid process that is allegedly used to make Braggs. I hope this answers your question. Loved you first post! I have been looking for recipes for kale and this came at a perfect time. My problem is generally finding the ingredients as we live on a small island (we don’t even have a Whole Foods or Trader Joes ;( – just a very small health food store but off I will go in search of the coconut oil and buckwheat groats. I should b able to find the other ingredients. Thanks Stefanie – keep blogging! Hello Mrs. Ide! Thank you so much for your support. I will soon be posting a page with recommendations on where to find some of the more unusual ingredients. In the meantime, check out Nuts.com, where you can find nearly all of the dry goods like buckwheat groats, seeds, lentils, special flours and other items that might be hard to find in standard grocery stores. Another good one for grocery items like coconut oil, nama shoyu and rice vinegar is Vitacost. The prices and shipping costs at these stores are very reasonable.